The article for the second Journal Club meeting is now available. Kyle Thomas, a PhD candidate in Criminology who participated in the first session chose this article from the American Journal of Public Health. This is a really interesting article and should make for excellent interdisciplinary discussion. Please let Tyler or Kriti know if you would like more information. We look forward to seeing you ! 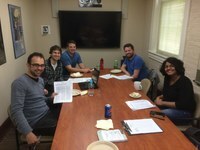 In the second session of the MPRC Journal Club, we scrutinized a criminology article in the American Journal of Public Health, that examines racial and ethnic differences in committing violence. We had representation from the criminology, family science, and sociology departments on campus, which gave us additional insight into the field of criminology and the style and standards for publication in the top public health journal. The most spirited portions of our discussion revolved around the use of verbal - rather than mathematical - IQ scores in modelling differences in violence, in addition to the article's unexpected focus on immigration and immigrant status. In sum, it was a vibrant session and proved to be a valuable, interdisciplinary learning experience. We are looking forward to our next session on November 14.